Payment is required at the time of services unless alternatives are arranged prior to the service provision. Payment can be made by cash, eftpos, HI-CAPS, credit card or cheque. Westbrook Family Dental Pty. Ltd. Reserves the right to change these conditions from time to time as it sees fit and your continued use of the service will signify your acceptance of any adjustment to these terms. You are therefore advised to re-read this statement on a regular basis. Westbrook Family Dental reserves the right to refuse service to those who do not accept or who breach the terms and conditions detailed herein. This offer is only available to clients who use the service between 1st October 2018 and 30th June 2019. Therefore, limited spaces will be available for appointments. Applicable item numbers include: 011/012/111/114/115/121/037 for the duration of the promotional period. Limit 4 claims per 022 per client for the promotional period. In order to be eligible for this promotion, if you have private dental cover, it must have been at least 6 months since your previous claim through your health fund on 011/012/111/114/115/121 to claim on these again. This includes any claims made through any other dental practice. Of the services included in the promotion, those that are offered will be at the discretion of the treating dental professional who will take in to account the individual health requirements of each client and the risks and benefits to the client’s health of accepting the service. In addition, services to which client or carer does not offer valid verbal consent, will not be provided. 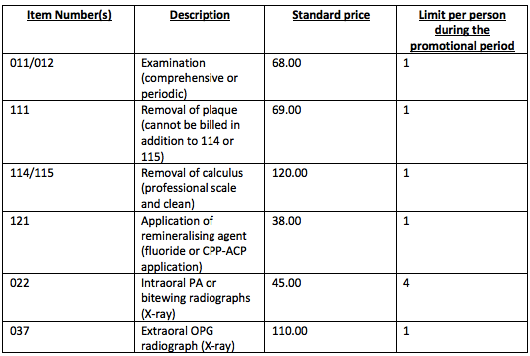 If a client without private dental health cover attends for a combination of any of the following items and is within the limits detailed in the table below, 50% of the standard prices for each item with be charged. The exact cost for each service is detailed in the table below. For example, should a client attend and receive a comprehensive exam (012), clean (114), fluoride treatment (121), 2 x Bite-wing Xrays (2 x 022) within the single visit, they will pay no more than $158 for the appointment, otherwise valued at $316. If a client valid private dental health cover attends for a combination of any of the following items and is within the limits detailed in the table, NO out of pocket cost will apply for those services provided within the single visit. If a client is currently eligible for the CDBS, all eligible services will be bulk billed up to the remaining value of the voucher. Should the required services amount to more than the remaining balance of the voucher, the legal guardian of the client will be notified of the out of pocket expense, and their consent will be obtained prior to completing any treatment. Of the services included in the promotion, those that are offered will be at the discretion of the treating dental professional who will take in to account the individual health requirements of each client and the risks and benefits to the client’s health of accepting the service. In addition, services to which client does not offer valid verbal consent, will not be provided. If a client without private dental health cover attends for a combination of any of the following items and is within the limits detailed below, a total cost of no more that $199 out of pocket will apply for these services provided within the single visit. For example, should a client attend and receive a comprehensive exam (012), clean (114), fluoride treatment (121), 2 x Bite-wing Xrays (2 x 022) and an OPG xray (037) within the single visit, they will pay no more than $199 for the appointment, otherwise valued at $426. If the value of the combined services offered during the appointment comes to less than $199, only the value of the services will be charged. 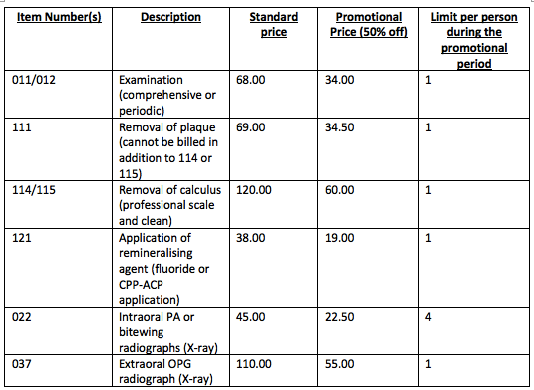 For example, should a client attend and receive a comprehensive exam (011) and 2 bitewing xrays, the total cost for the appointment would be $158, as the full price of these items would apply (as detailed in the table below). If a client valid private dental health cover attends for a combination of any of the following items and is within the limits detailed in the table, a total cost of no more that $99 out of pocket will apply for these services provided within the single visit. For example, should a client attend and receive a comprehensive exam (012), clean (114), fluoride treatment (121), 2 x Bite-wing Xrays (2 x 022) and an OPG xray (037) within the single visit, they will pay no more than $99 for the appointment, otherwise valued at $426. If the gap payment dictated by the health fund for the combined services offered during the appointment comes to less than $99, only the specified gap will be charged.